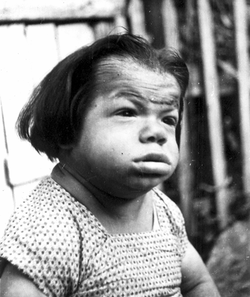 Cretinism is presented with hypothyroidism, mental retardation, large tongue, impaired neurological and musculoskeletal development, short stature, edematous face and abdomen distention. Cretinism is associated with congenital form of hypothyroidism. In this case, hypothyroidism, develop during infancy mostly due to deficiency of iodine, deficiency in enzyme which synthesized thyroid hormone or defect in the thyroid gland such as enlarge thyroid gland.There will also be an accumulation of hyaluronic acid and glycosaminoglycans. The treatment of cretinism may include synthetic levothyroxine or iodine supplement/ addition to the foods.